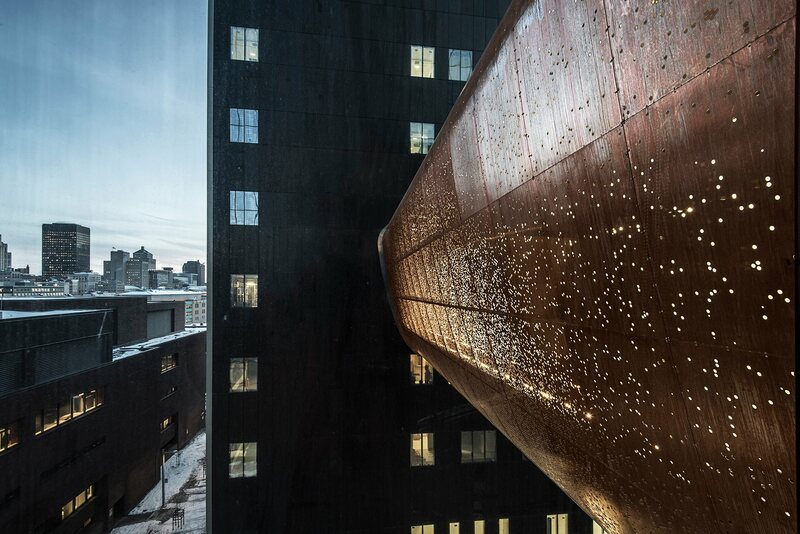 We are excited to share that the Centre hospitalier de l’Université de Montréal (CHUM)’s passerelle has received the first ever Association des entrepreneurs en revetements metalliques du Quebec (AERMQ) Innovative Design Award. 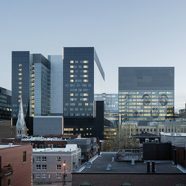 To connect the CHUM to a neighboring research building, the elevated passerelle (bridge) floats above Montreal’s Sanguinet street and helps mark the entrance to the new hospital. Interestingly, the City of Montreal has a long history of saying no to elevated bridges connecting multiple buildings over the public way. 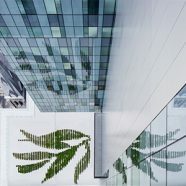 In order to not set a precedent on the CHUM, the city required the bridge meet a number of stringent conditions, including being an exceptional object of art itself. As such, the passerelle is designed as a floating lantern. 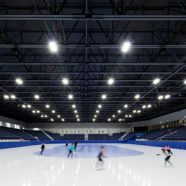 It creates a sense of architectural lightness with its primary structural beams concealed above, with the floor, frame and facades seemingly suspended in air. 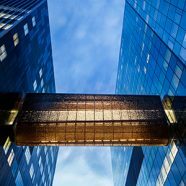 The entire bridge structure is wrapped in a series of sculpturally formed stainless steel ribs clad with curved perforated copper panels. The use of copper for the passerelle was intentional. 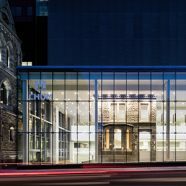 The material has a rich history with the architecture of Montreal – as testified today by the city’s many copper-adorned cathedrals, churches and public buildings. Our team is honored to see the passerelle received this award from AMERQ and proud to have partnered with NEUF Architect(e)s on the design.